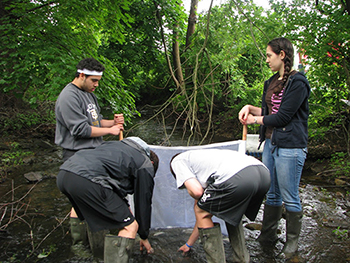 Chatham High School students during a SWaMP field trip to test water quality along the Passaic River. Great Swamp Watershed Association’s School Water Monitoring on the Passaic (SWaMP) is a free program that teaches high school and college students in communities along the Passaic River and its tributaries the impacts of pollution and land use on water quality by engaging them in hands-on environmental science and water quality monitoring. With our assistance, students perform chemical, visual, and macroinvertebrate testing on a sample site near their school. The results are posted and made available to the general public via an interactive website that shows all test sites, which school tested which site, and the results of those tests. Chemical: The test kits measure pH, water temperature, dissolved oxygen, phosphate, nitrate, turbidity, total dissolved solids, and E.coli. We use the findings as a talking point to discuss issues that might be present upstream or at the testing site. Visual: The visual assessment is a great tool to ignite critical thinking. Students grade canopy cover, buffer width, bank erosion, flow, and more. They compare their observations to their chemical results to determine possible causation. Macroinvertebrate: The student’s favorite! Students don waders and set off into the river with collection nets. They work as a team to gather benthic macroinvertebrates (invertebrates that live on river bottoms). Students then identify the species they find and categorize them into pollution tolerant, pollution sensitive, and pollution intolerant groups. They compare this data with their chemical and visual assessments to determine what parameters might be affecting biodiversity and macroinvertebrate life. The quality of the water in the Passaic River changes as it flows downstream from its origin in the Great Swamp to its outlet in Newark Bay. 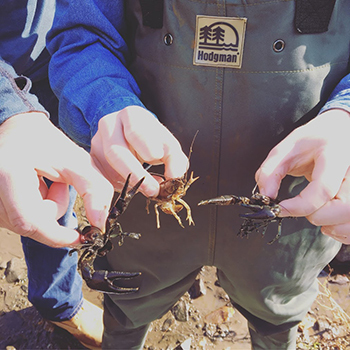 By inspiring students along the entire length of the Passaic River to be stewards of their local environment through practical hands-on testing, they’ll come to understand that they can change their environment by changing their own behavior and that of their communities. How Can I Sign Up!? Anyone interested in learning more about this program should contact Sandra LaVigne, at (973) 538-3500 or sandral@greatswamp.org.